The chocolate-within-the-chocolate is a Symphony bar. 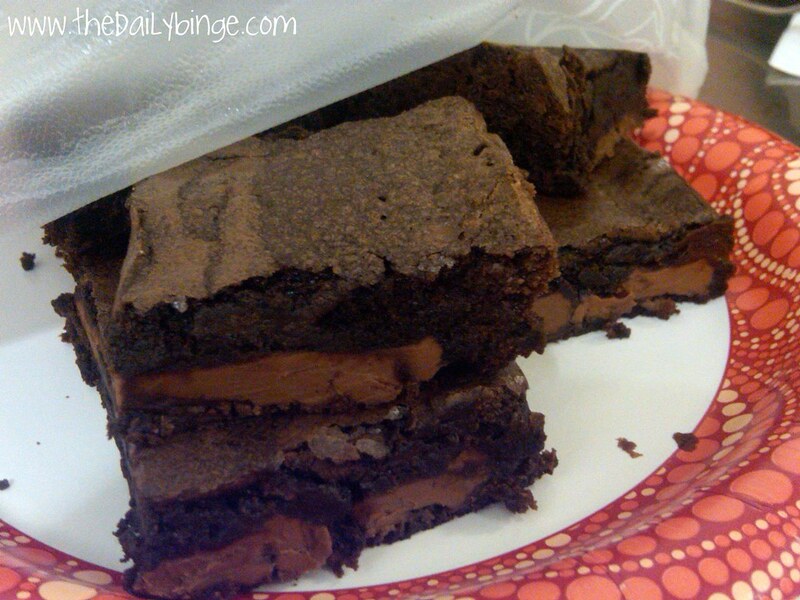 These brownies look delicious, but they got me into all sorts of scrapes. 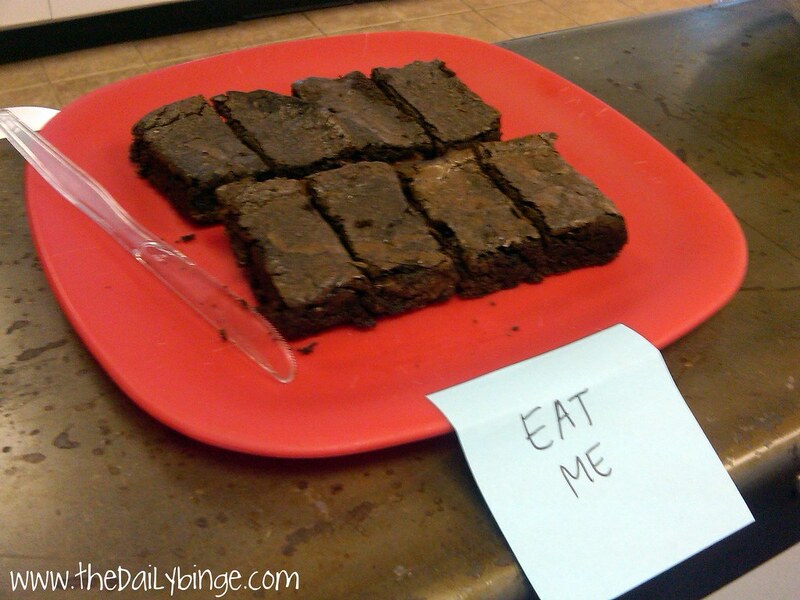 No good brownie goes unpunished! Two Mondays ago, you may recall that Whitney, Bea and I went to 8oz Burger Bar. Bea told me that she made me brownies, and that they were stowed away in her car. So when dessert came around, we told the waiter that we were all good. Brownies in the car! The waiter said, “Oh wow, yum. You could tip me in brownies.” Something like that. Total throwaway line. We did not take him seriously. Because of our Living Social coupon, the bill was about $18 (he didn’t recalculate it to reflect the coupon, so… thanks for that, guy). We gave him a $20 bill, planning to combine the change with even more ones. You know, his tip. Wait, what? Food servers don’t want to get tipped in FOOD? Really? According to Crystal, all the waiters at 8oz are like that. Sad. Actually, bad. Bad for business. So we needed a brownie-friendly 2nd location, which could ideally provide us with milk or ice cream. We picked a no-brainer: Milk. 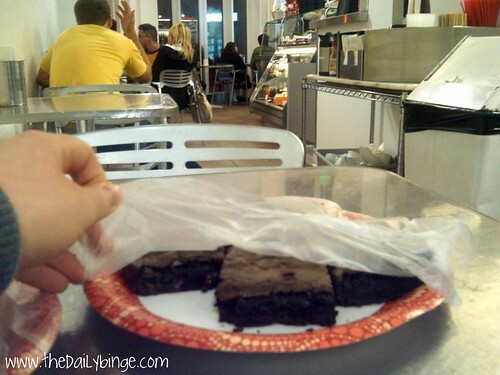 But they actually sell baked goods of their own at Milk, so we sorta snuck our brownies in and hid at a back table. I took this picture of our brownies, with Milk’s baked goods counter in the background. Haha! What a caper! 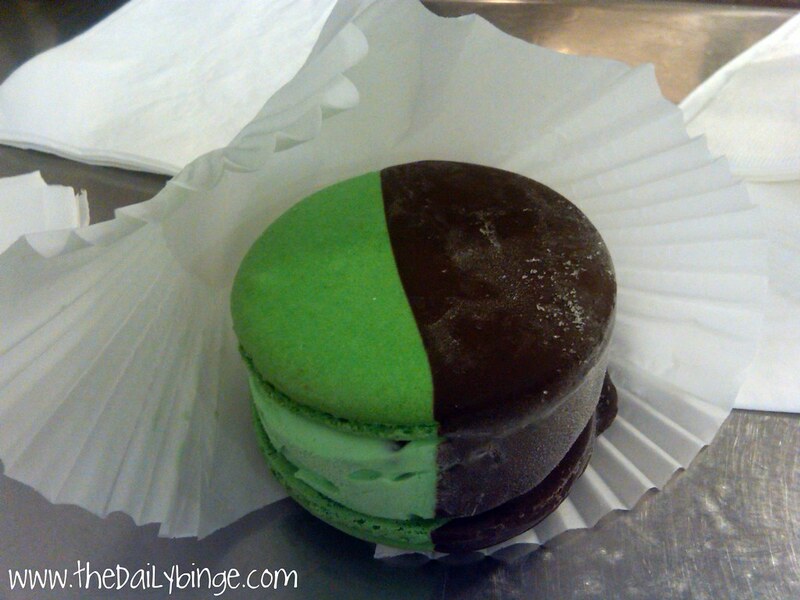 We got ice cream in the form of a mint chocolate chip ice cream sandwich. Might have been called a grasshopper? I love that the ice cream is sandwiched in MACARONS! We were already super full from burgers etc, so we were struggling to eat dessert. But we agreed that Bea’s brownies were probably more delicious than anything we could have purchased. The next morning I still had two plates of brownies, more or less. I kept all the brownie’s we’d nibbled into, and took about 4 unscathed brownies to work. I cut them into smaller pieces and set them out in the kitchen. You know, to be nice. People were legit upset that someone would bring a high-calorie baked good into the office. People kept saying, “Who made these?” Since I didn’t make them, I figured I was in some sort of loophole situation. And it reached a point where it would have been weird to ‘fess up. So… I didn’t. Until now. That’s why I waited two weeks to blog the brownies/Milk. 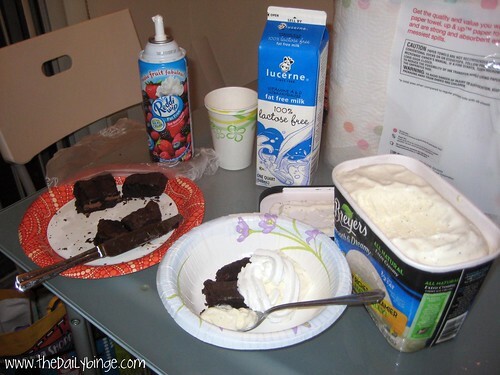 Actually– after all that fuss, most of the brownies WERE consumed. People just need to express their disdain for dessert before eating it, so they don’t seem like… they’re enjoying dessert TOO much? It’s catharsis. Or something like that. I’m not MAD, because the whole reason I brought them in was that I didn’t want too many brownies in MY kitchen. That’s a dangerous game. I didn’t want everybody to hate me for bringing the brownies. I was just trying to be nice! But although the brownies created two awkward situations, they were also the gift that kept on giving, because I ended up having TWO brownie sundae/TV nights that week, each time with a different friend. And neither of those people resented me for thrusting brownies upon them! Proud-of-myself moment: I bought that ice cream TWO Tuesdays ago, and TWO people other than me ate some of it, and I’m STILL not done with it. Generally a bigger container than that would last JUST me… less than a week. And then everybody ate the brownies. Ha ha, only in LA would people assume you had malice aforethought for bringing brownies in to work. In most other locations you would be hailed as a hero and appreciated for your thoughtfulness. Those undercover brownies look delish! I didn’t expect to be hailed or reviled. But either one is funnier than a normal response! To be honest, we play this game in my office as well. I always leave a sign stating what it is and my name, because we definitely have gross people in our office and we don’t want to eat anything made by their grimy hands. Ick. Previous Previous post: Thank Goodness It’s Friday.